Take home the 7-passenger luxury SUV that'll help you and your family turn heads on Denver roads when you buy or lease a 2019 Volvo XC90! Our Volvo dealership in Denver, CO, has the new Volvo XC90 for sale, and our Volvo sales team is happy to walk you through the XC90 specs and price. Visit us to compare the 2019 Volvo XC90 to the 2019 BMW X5 and 2019 Audi Q7 to see why more Colorado drivers are switching to the Volvo brand. 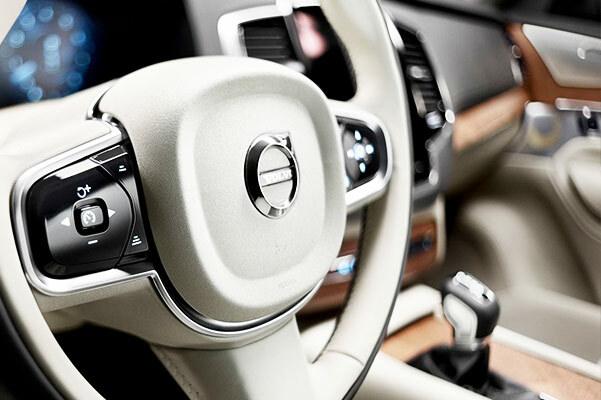 Once you compare the 2019 XC90 specs, interior and price, you'll know that this luxury SUV is right for you. Get directions to Rickenbaugh Volvo Cars and begin a new Volvo XC90 lease! Why pay significantly more for a competing luxury SUV when everything you need for an incredible journey is inside a new 2019 Volvo XC90? The 2019 XC90 starts at the lowest MSRP when stacked up against comparable BMW and Audi SUVs, and the new XC90 can seat more than the new BMW X5 on Greater Denver roads. Packing for a weekend getaway? You'll want to buy a Volvo XC90, as the new XC90 interior can be configured to store the most cargo out of the three SUVs listed below. You can also sync your compatible smartphone to your new Volvo whether you have an iPhone or Android, which isn't possible with the new X5. Even your friends in the third row will enjoy a superior drive, because the new XC90 is the only luxury SUV here to come standard with third-row air conditioning! Factor in the safety and security of standard Active Bending Lights and City Safety Collision Avoidance Technology, and you'll find that the 2019 Volvo XC90 is the right new Volvo for you! Contact Rickenbaugh Volvo Cars to learn your Volvo financing options and buy or lease a 2019 Volvo XC90 in Denver, CO. Continue to compare the 2019 XC90 SUV to see why you should begin a Volvo lease!